John of Trevisa (1326-1402) was Vicar of Berkeley, Gloucester, and chaplain to Thomas, 10th Lord Berkeley. Having been expelled from his post at Exeter College, Oxford, Trevisa continued his career as a clergyman and scholar under Lord Berkeley's patronage. This manuscript presents his English translations of three Latin texts, one of which is incomplete. A translator rather than an original author and not a great scholar, he is credited mainly with providing important examples of early English prose which were used by later writers such as Shakespeare. The book begins with Trevisa's translation of 'A Dialogue Between a Lord and a Clerk', an anonymous early 14th-century defence of Philip IV's policies against aspects of papal authority. Its first letter is historiated (bears a picture) showing the two speakers, the lord in his finery and the clerk, engaged in conversation. The picture's style closely resembles that of an artist working in London in the early 15th century. 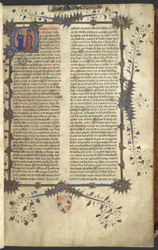 The arms at the bottom of the page are those of Richard Beauchamp, Earl of Warwick (1382-1439), for whom the book was probably made. Trevisa mentions in this treatise verses from the Book of Revelations inscribed in Latin and French in Berkeley church, which he may have had done.